Caravan: Right to enter or existential threat? 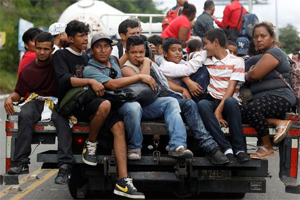 Nolan Peterson delivers a powerful first person account of traveling with the Migrant Caravan now headed to America that captures sentiment and propaganda, but not the cost of new unskilled workers who drive wages lower for citizens, risk social services and destabilize economy. 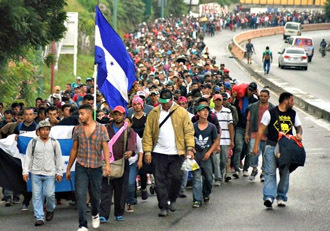 From this report published by The Daily Signal; the caravan is a direct result and deliberate contrivance of open border activists who declare peace, but deliver threats. Titled, “‘It’s Your Right to Go to the US’: What I Saw When I Visited the Migrant Caravan” Peterson provides quotes of participants that even media egotists should understand as an “invasion” threat. It is a long piece well worth the time to read, but here are a few highlights. The migrant caravan has its own de facto government, and on this night the travelers from Central America gathered at the behest of a few leaders to discuss issues of the day as well as the big picture—such as what route to take to the U.S. border. “It’s your right to go to the U.S.,” Milton Benitez, a political analyst and sociologist who hosts the Honduran TV show “El Perro Amarillo,” implored the impassioned crowd. 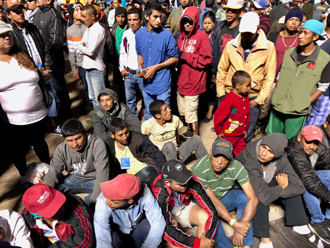 In a scene not unlike when a coach rallies his players before a big game, the Honduran media figure pressed the encircling migrants on the night of Nov. 7 not to give up on their “mission” to achieve the U.S. border. 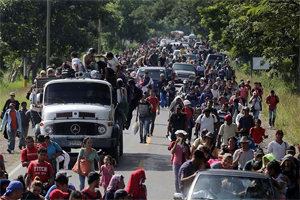 The large group ensconced last week in Mexico’s capital was the foremost and largest of five migrant caravans traversing the nation and headed north. Altogether, they comprise roughly 12,000 people, mainly from the three Central American countries of El Salvador, Guatemala, and Honduras. Gabriella, a 20-year-old woman from Honduras, sat on a steel blue sleeping pad with her 11-month-old daughter Ayesha cradled in her arms. Mother and child were encamped on the grounds outside the Jesús Martínez Palillo soccer stadium along with roughly 4,500 other migrants. “We’re here for lack of work,” said Gabriella, who asked that her last name not be published. Peterson writes further that “hidden hands” are moving people north. Benitez, the Honduran television personality, is also a member of Pueblo Sin Fronteras, or People Without Borders, according to Mexican news reports. The group’s influence was on full display during the raucous nighttime assembly Nov. 7. The nonprofit’s organizers urged migrants to press on and offered seminars to prepare them for questions at the U.S. border from officials charged with verifying asylum claims. 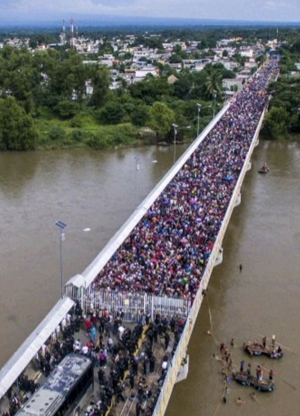 Of the 4,500 migrants encamped last week in Mexico City, U.S. and Mexican officials estimated, roughly 60 percent were men, 30 percent women, and 10 percent children…. Darly Maria Galeas Amaya, 27, from Comayagua, Honduras, said, “My dream isn’t to stay in Mexico … my dream is to get to America to be able to, I imagine, to be able to give a better life to my children,” said Amaya, traveling with her husband and 9-month-old son. Javier and the other American lawyers were there as part of People Without Borders’ effort to educate migrants about the U.S. asylum process. Some of the lawyers said they learned about the operation from group email lists. David Inserra, a policy analyst for homeland security at The Heritage Foundation, traveled to Mexico City to observe the caravan firsthand. Click here for more from The Daily Signal. This entry was posted in National on November 19, 2018 by admin.